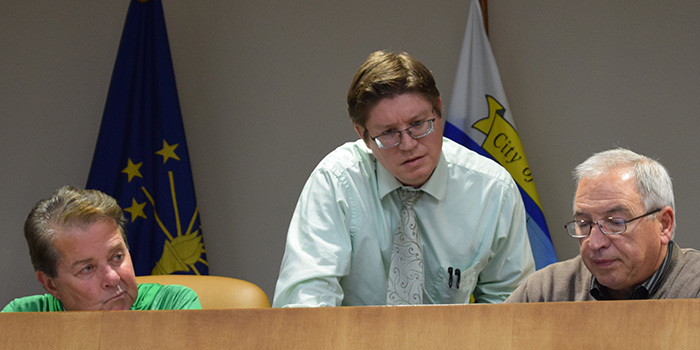 City Planner Jeremy Skinner, center, explains the appraisals for Polk Drive to commissioners George Clemens, left, and Mike Klondaris. WARSAW — The Warsaw Redevelopment Commission heard updates on multiple projects that have been in years in the making during the meeting held yesterday, Dec. 3. The Gatke project continues to move forward. The commissioners were presented with an updated economic development agreement with Michael Kinder & Sons, Fort Wayne, to review. The agreement, which is not yet complete, lays out the requirements of the city and of the developer for the redevelopment of the property. The project would include the rehabilitation of the 20,000 square-foot existing building into a multi-use space. Michael Kinder & Sons are rehabilitating the building and would then lease the spaces out to interested businesses. Zach Kessie, Michael Kinder & Sons, said that the project is still moving forward and that he has been meeting with three potential tenants. He hopes to have the tenants, which he would not name, sign letters of intent sometime within the next month. Kessie’s hope is to have the project launch next spring. City Planner Jeremy Skinner was hesitant to give a timeline, mostly due to the fact that this project has been ongoing for many years. He did hint that the tenants would not be using the space for just offices. He said there was potentiation for an entertainment venue and some manufacturing. It was noted that this would hopefully be a space that is open beyond typical business hours. “It would be fantastic if we could get this done,” said Commissioner Rick Snodgrass. “We’re going to make it happen,” replied Kessie. Skinner also announced that the city had received funding from the Indiana Housing and Community Development Authority for its senior housing project to be located at 805 E. Market St. It was awarded $1,155,000 in housing tax credits and $500,000 from the Development Fund. The development will include 72 newly constructed units for seniors. Skinner noted that this is the fourth time the city has applied for this funding and stated it was a lesson in perseverance. The commission approved the appraisals and purchase of the improved street and lift station located at Polk Drive as Phase II of the tech park. The purchase agreement was in the amount of $2,317,588, which was below the two appraisal estimates. West Hill Developments took possession of the acreage at the beginning of the project to make the necessary improvements. A contract with Barnes & Thornburg was approved for their bond work associated with the Airport Industrial Park sanitary sewer project. The commission approved the application for disbursement of project funds related to phase I of the Buffalo Street project. The city hopes to use these funds to begin work on the Buffalo Street Plaza next year. The next meeting will be held at 4 p.m. Monday, Jan. 7.